Let me start off by suggesting that if someone tells you, that you “must believe” this or that to belong to their religious group, that might be a sign of a problem. For one, it would suggest that the belief was not compelling on its own terms and therefore needs some extra backup. In this case, the implicit threat of exclusion. I’d like to think of religious belief as not needing that kind of sanction. Rather once heard or engaged, it could be illuminating or not of one’s experience such that the belief could be received as a gift or could be put aside for something more fitting. Or perhaps the belief could provide a context for jogging one’s own mind about these questions So it is in that spirit that I share my Easter reflections. I don’t believe Jesus was into hero worship. The many examples in Mark, in fact, suggests a “secret messiah”, one who was not eager to make claims about himself, what less to the public. One might contrast this with the Gospel of John, where Jesus makes a number of long soliloquys about who he was and his relation to God. But also in John, we are given the last supper story which has the claim that the teacher is not greater than the student. 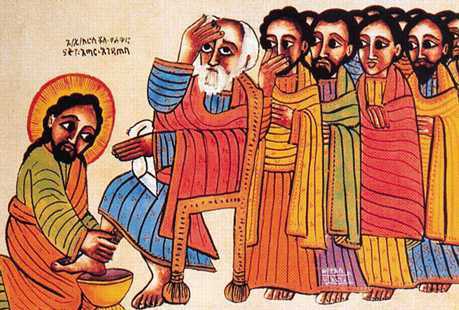 This is the story where Jesus washes the disciple’s feet. And it is in John where declares Jesus his friendship with the disciples. For Aristotle, one cannot be friends with God, because friendship requires equality. One cannot be friends with women because they are below men, same with children and slaves. And the Gods are forever above men. And yet Jesus goes against the hierarchy, declaring his friendship with God, with men, with women, with children, with every walk of life. Which in Greek thought, means he declares his equality with them. If Jesus’ life was salvific it was not because he was a God that towers over humanity, rather it is because he presented a God that is in our midst as a fellow companion, a friend, someone who shares our lot even unto death. He did that with his sermons, but he also did it with his life. When he ignored hierarchies to welcome all and mingled with society’s undesirables, his life becomes a parable. A parable that tells us something about the character of the good and helps us envision salvation and God. Because he represented God, we can imagine how this became finally a doctrine that Jesus was God. And this must be believed. It became a litmus test of who is in and who is out for a church that had become coextensive with empire. But a doctrine, a church, and a God that is over and against us, cannot save us. Only one who was of no account and rather stands with us has that ability. The one who helped others reclaim the imago dei in them that we might help others reclaim it as well. Likewise we are given a range of resurrection accounts. Let me mention some that are the most compelling to me. Paul meets the risen Christ through a conversion experience that ends his reign of religious persecution. The disciples welcome a stranger to dinner after the crucifixion and when the bread was broken and blessed, they recognized Christ in their midst. 1800 years later, when the Cane Ridge revival broke out, one of the signs that it was of God is that slaves were freed. Encounters like these affect a transformation that liberates ourselves and other people as a result. No, I don’t believe the laws of nature were suspended and that the resurrection is what happens when biology is set aside. So that one’s earnestness of faith can be measured by increasing the unlikelihood of the event. In that I fail the test of “orthodoxy” Mark Twain once said that “faith is believing in what you know aint so”. And the way the resurrection is often presented to us seems to confirm this. But I believe different. I think resurrection fits the logic of God and our world, because we have seen it in our own lives and in the lives of others. That is, we have seen new life happen against the odds. We’ve seen empires crush others, only to see ideas take root and overturn those empires. We’ve seen what experts tell us is human nature, only to see something more beautiful emerge. And we get drawn to those stories, in particular, because it means that our hopes for this world are not in vain. In that the Easter story should be fully recognizable to us, the story is universal to us. Of course it is unique as well. It involves an individual, in a particular context, which produces a unique historical trajectory and in this case, a religious tradition. One that I’m a part of and which has opened up ways of living in and describing the world. But I believe that is exactly what God uses, to become incarnate in the world. God needs us in all our particularities and uniqueness to be the context of God’s saving work. To affirm this doe not negate other traditions and their particulars. If it did, the good news of Easter would cease to be good news. Dwight Welch is the campus minister at Ecumenical Campus Ministries at the University of Kansas. Good point. But, then, most of your points are good points. Really loved the post. Thanks!